I give to United Way through the Tocqueville Society because United Way invests in community programs with outcomes. We all have the power to affect the lives of those around us in a positive way. We can all be part of the solution if we LIVE UNITED. I give to United Way through Catholic Charities because I feel they use my donation for the most good. Just a personal opinion and I'm glad United Way lets me choose where my funds go. I give to United Way through my employer because it makes me feel good to know that I can make a difference in my community in a way that might not otherwise be possible. I really do believe that one person can change the world and United Way helps me be a part of that greater good! I teach life saving skills through the American Red Cross. I teach Adult CPR, Infant/Child CPR, First Aid and AED to the Nashville community. I live United through Catholic Charities. I choose to donate to them because I work for them and see how they touch people's lives every day. I work for their pregnancy counseling and adoption services which provides counseling and support to women and men who find themselves in a difficult situation, facing difficult decisions and need the help and support of a caring and understanding organization. I give to United through my employer and designate most of it for the Rescue Mission. The work they do to get people back on their feet and being productive and what they do for women and children is so important. I live united by giving through my emplyer The Freeman Webb Company. My donations makes a differnce in the lives of the people. I live United through Alive Hospice. I know that my gift will help those in need receive much needed radical loving care in their final days and hours of life. I give to United Way through Waves of Williamson County. I have some friends whose siblings attend this organization because of Downs Syndrome. This is a wonderful way for everyone to feel needed and make a difference no matter their situation. I give to Middle Tennessee Council - Boy Scouts of America through United Way, and directly through volunteering at the Unit, District, and Council level, because of the impact Scouting has on youth in our community by teach life and outdoor skills through age appropriate activities. I think United Way is one of the best things about the Nashville community. Who or what else would bring so many people together to help our neighbors in so many areas of their lives. I am glad to see that people support specific charities, but honestly I don't have the time to figure out who is doing what. 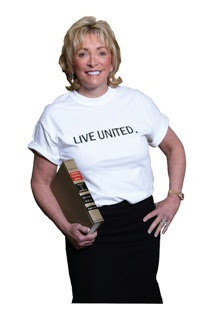 I am delighted that United Way has volunteers to do the work for me. Hats off to them all. United Way rocks! I live united by being a blood donor. And by giving to other. I give to the United Way because it gives me great pleasure to know that I am contributing to a great organization that truly helps the community. I give to United Way through my employer Hca because when I was 17 the United Way was all that stood between me and the streets, they helped me when I could not even help myself. I will never forget them for what they did for me. I serve the elderly and make sure they have what they need and with united ways help I'm able to feed them healthy, hot lunches everyday.Also with volunteers help the meals get delivered and the elderly get to have some contact that makes me aware of their living environment.I also go see them myself to make sure they are okay. “Service to others is the rent you pay for your room here on Earth." In addition to my financial gift to United Way, I volunteer my time as part of the Review Team. As a result I've been able to see the impact United Way has on various programs in Nashville. At the end of the day I think we all want to know that what we do matters and that we've made a difference in someone's life. Giving one's time and money to this organization makes a difference in the lives of thousands of Tennesseeans every day. That's what it means to Live United! I live united by engaging numerous people in a variety of ways. I am regularly published in the Tennessean, encouraging various ways of uniting as a community. I connect people with resources they don't know about, including United Way partner agencies such as FiftyForward. I volunteer throughout the community, including United Way partner agencies such as St. Luke's Community House. I donate through workplace giving at the State of Tennessee, where I am happy that increased giving options will be available this year. I live united through working to break down the walls of organizational territoriality among workplace giving federations and nonprofit agencies in the community. Before I started working for United Way, I didn't realize the impact my donation could make if I gave TO United Way instead of designating my money to an agency. Now that I see how the Outcome Based Investment process works, I will never designate my dollars again. OBI dollars help to fill the gaps in our community and I know my money is being used in the most at-risk areas. I know first hand how United Way affects persons lives several years ago I worked with a non-profit organization that provide grant fundings for those who were on the Families First Program. To see those grant funds provide low-income families a chance to better themselves was empowering to me. I see some of my past clients and see that it was worth the long hours of tracking, and keeping them focus on thier goals and for that I tip my hat to United Way and applaud them for all the areas that they touch people lives!